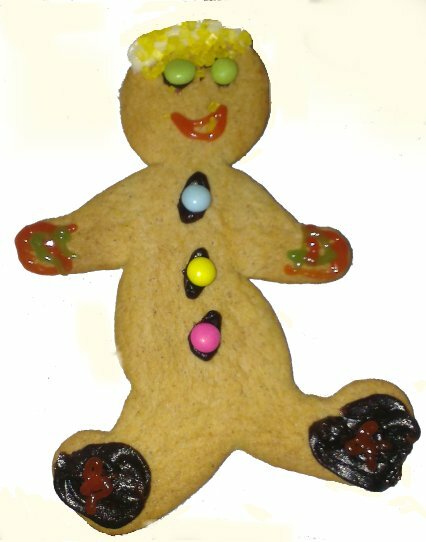 One of Our Gingerbread Men is Missing! Yesterday, Bean and Plum made gingerbread men. They did a great job. I got to make one too, and decorate it. It’s cold out, so I gave him some nice, warm, sturdy boots, some warm mittens and a woollen hat. I left him with the tray of men the children decorated while I made tea. It got hot in the kitchen whilst I was making tea, so I opened the window. After tea, the children each ate one of their gingerbread men. Whilst I settled PK, Bean went to look adoringly at the other gingerbread men, deciding which he would have tomorrow. He came dashing into the front room looking shocked. My gingerbread man was missing. Where he used to be there was a letter, written on the bottom half of one of my recipe sheets. I know you wanted to eat me but I didn’t want to be eaten. I have gone on holiday on instead. I will send you all a postcard. The children spent some time discussing this. It was decided that it’s all my fault, because I gave him sturdy walking boots and then left the window open and unattended. Didn’t I know gingerbread can come to life? So it seems like a great opportunity to add Gingerbread Man’s travels to our postcard/geography project and track his holiday around the world. And this is where you come in …. it would be great if you could send a postcard from wherever you are, telling us where you saw him and what he was up to. You could even pretend to send it from the Gingerbread Man, telling us about the latest place he has visited! Please ask friends and family to do the same, and share this post – it would be great to collect as many postcards from our errant Gingerbread Man as possible.